In this four-part blog series, I have briefly reviewed some of the myths we’ve heard about Windows 8 security improvements and point out where deficiencies lie. 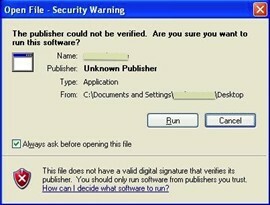 We believe security should still very much be a concern for anyone running the new Windows 8 OS. Visit this earlier post to learn more about the series. In today's post, I'll address Myth #4: SmartScreen will keep users out of trouble. First introduced as a security add-on feature for Internet Explorer v8.0, the SmartScreen Filter (SSF) checks the sites a user visits and the files they download and compares them against lists of known malicious sites and files. When it finds something it doesn’t like, it intervenes and in many cases prompts the user to take action. The problem here though is that in those situations where sites or files are unknown, all SmartScreen really does is pushing the decision making off to the user. Unfortunately the information provided to the user to help them make an informed decision is limited thus putting the user into a difficult situation. Generally users don’t make consistently good security decisions and indeed it’s unreasonable to expect them to do so, after all users rely on security software to protect them. How would you react when faced with the following SmartScreen prompt? It’s not an easy decision to make and after seeing this prompt a few too many times I suspect you’ll quickly grow weary and just click ‘Run anyway’. In fact the SmartScreen dialog prompt very much reminds me of the all too familiar Windows ‘Security Warning’ dialog box that most users regularly ignore. I predict SmartScreen will end up being about as useful as this, in other words, not very. As I look at all of the chatter around the new security features being introduced with Windows 8, I don’t see technology that will significantly move the needle in terms of protecting users in this new Windows 8 environment. Make sure you protect your Windows 8 investment, choose a security product that bridges gaps present in the current operating system. Norton One and Norton 360 Multi Device products are designed to protect all your devices including those running Windows 8, and proven to make your Windows 8 device faster and safer. Gerry Egan is Senior Director of Product Management, Norton by Symantec. This post has been moved to "Norton 360" board for better exposure.